Top these soft and crunchy Southern Pecan Biscuits with delicious shredded honey ham, a spicy ginger pepper jelly, and a slice of sweet pineapple. Easy to make, the dough for the biscuits comes together quickly in the work bowl of a food processor; chilled, then roll, cut, and bake. The balance of the appetizer is finished in just minutes, making these treats perfect for any spring party or buffet. We recommend Bermuda Jam Factory’s Ginger Pepper Jam for its mild heat and sweet ginger finish. You can find it at the Fresh Market. Place the pecans in the bowl of a food processor. Pulse the food processor to fine chop the pecans. Add the cheeses, butter, flour, salt, and cayenne pepper and pulse until dough forms. Turn dough out onto the work surface and gently knead, about 5-7 times, until it just comes together. Divide into two equal pieces and pat into two thin disks. Wrap with plastic and place in the refrigerator. Chill until dough is firm, at least 2 hours up to overnight. Preheat oven to 350 degrees. Line two baking sheets with parchment paper; set aside. Roll the dough into 3/8 “ thick circle. The biscuits will crumble if cut too thin so be sure to stay at 3/8 of an inch. Using a round cookie cutter, cut into 2” round biscuits. Gather the remaining dough, gently shape into a disk and refrigerate until cold before you cut again. Repeat this process and cut all the dough into about 30 biscuits. Bake the biscuits until crisp, about 15 minutes. Let cool for 5 minutes on baking sheets before transferring to a wire rack to cool. Be careful, when warm they can be crumbly. Let cool completely before handling. 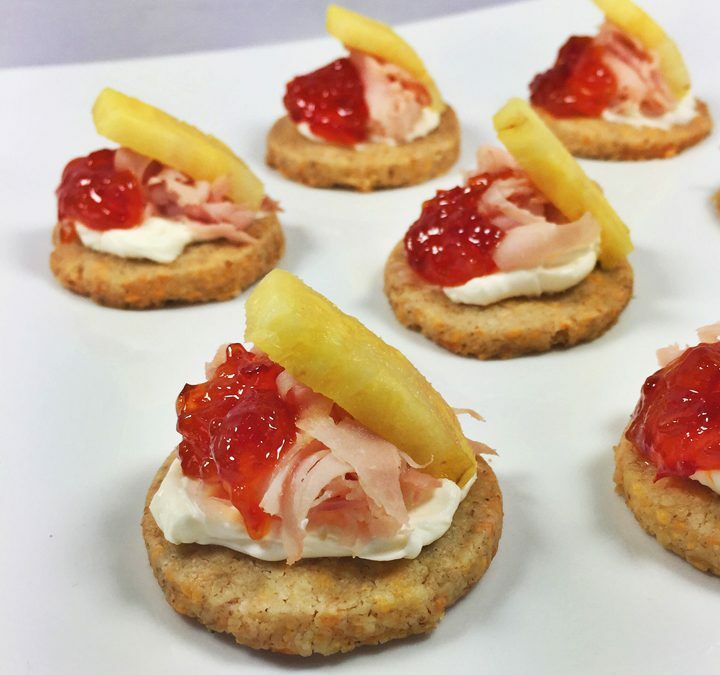 Carefully spread a very thin layer of cream cheese on each biscuit, top with 1 tablespoon of shredded ham, ½ teaspoon hot pepper jelly, and add a slice of pineapple.